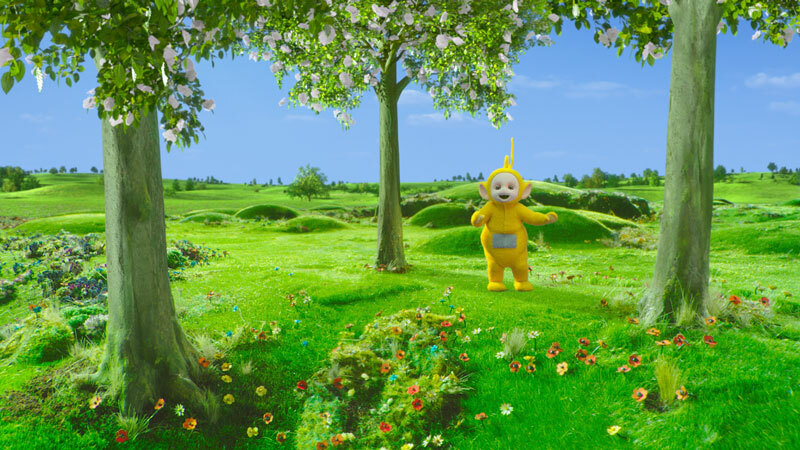 Lola Post Production has revealed its work as sole VFX vendor on 120 episodes of the new and updated version of Teletubbies, currently on CBeebies. The show became a huge hit in its original incarnation in the 1990s and the success has continued with the launch of the brand new series in 2015. Darrall Macqueen, the production company appointed by brand owner DHX Media, contacted Lola in the early pre-production days for advice on how to handle such a show. 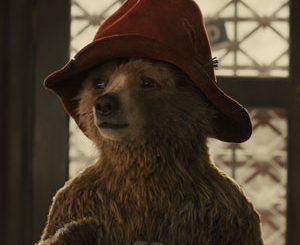 Both series consisted of 60 x 14 minute episodes, a wide range of story content and huge amount of CG that equated to two fully animated feature films. The Lola team approached this work as they would a VFX driven mini-series with each VFX shot given the same attention, with around 30 artists working on the project for a year. 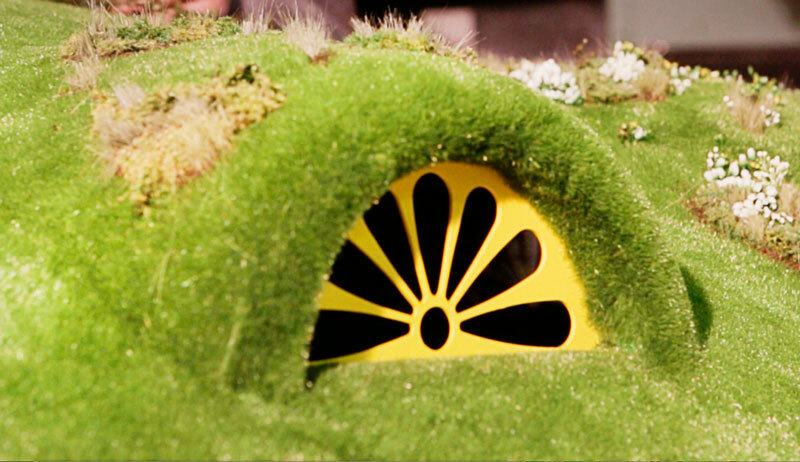 Finding innovative ways to marry old and new techniques to produce the best results, Propshop Productions was called upon to create a 3D-printed version of the model background, which was almost four metres across and dressed with synthetic grass, thousands of laser cut flowers, individually planted tree stumps and rabbit holes. This would ensure complete accuracy and durability—an important consideration as the model would have to last several months under studio lights. The whole thing was mounted on a massive turntable, marked in degrees so it could be turned to face the camera very quickly. For the more straightforward scenes, the CG model was used to pre-visualise the shot then the practical model was rotated on the turntable to match. This low-tech, but fast and efficient solution, allowed the background plates to be shot while the Teletubbies were resting between takes. 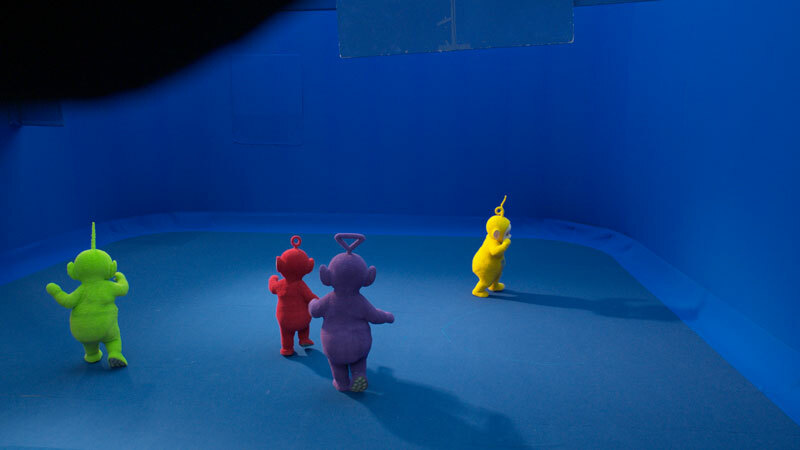 The complicated sweeping moves required blue screen Teletubbies performances shot with an Ncam System from The VFX Company attached to a crane. The data was then scaled by 1/20th and checked through the company’s Rig Chase system before being transferred to a Milo motion control rig and borescope lens to shoot the corresponding model background plates. 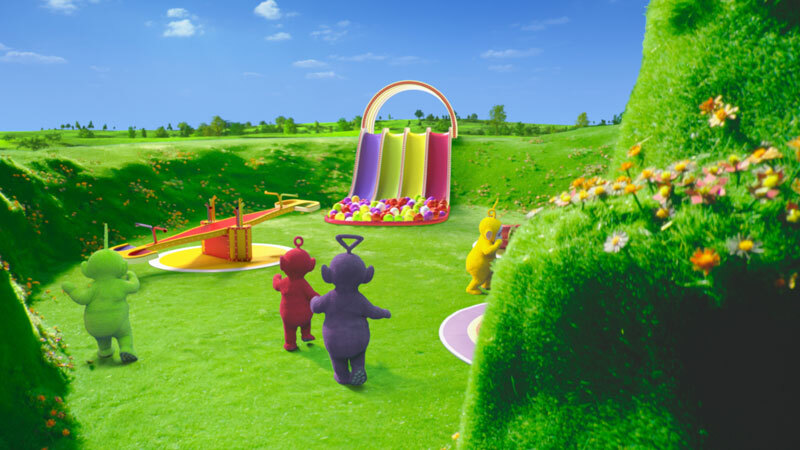 Series 2 of the Teletubbies is far more ambitious and expansive than the first series with brand new additions, including a Tubby Car to transport the Teletubbies from the Home Dome to a new location – a hidden playground called the Hidey Hup where they play on a slide, trampoline, roundabout and see saw. The car sequences use a CG pre-viz to plan the complex journey over the landscape. 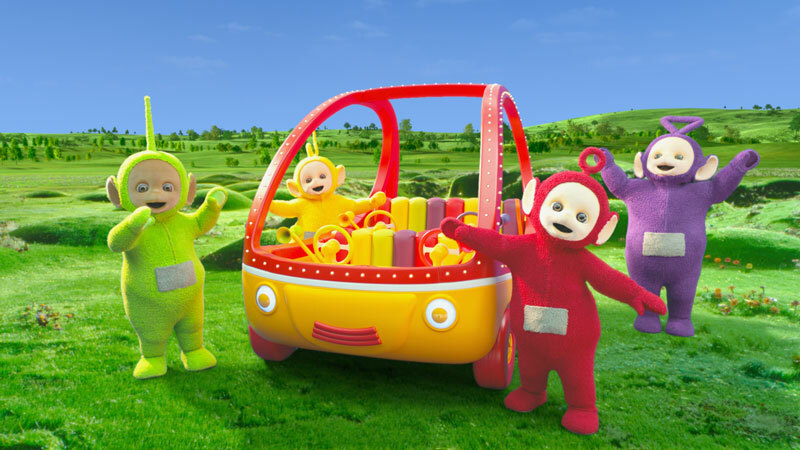 In the blue screen studio a full sized Tubby Car was mounted on a turntable linked to a Milo Motion Control camera to film the move around the landscape, allowing the Teletubbies to ride over and around mounds and trees. This move was scaled down and repeated over the model background and CG wheels were added to the car to steer it. The master shot is almost a minute long, so cheating wasn’t an option. 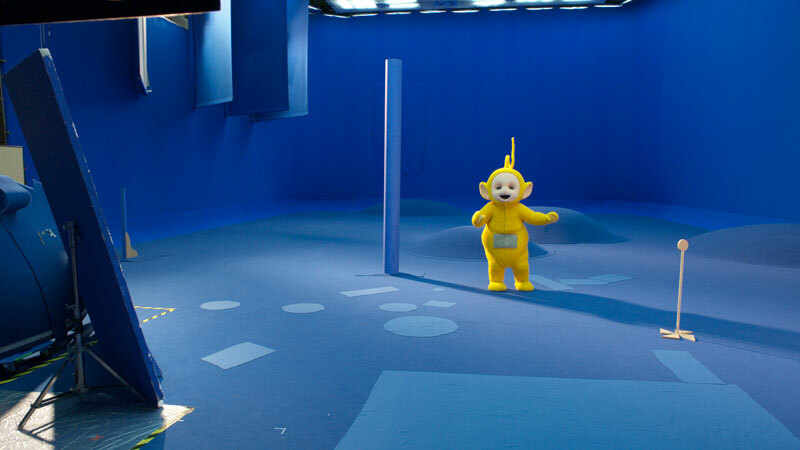 Full sized working pieces of playground equipment were built for the Hidey Hup scenes, shot with the Teletubbies on the blue screen stage and blended into the scale model. Another major key addition to the new series is the introduction of the Tiddlytubbies. These eight new fully CG characters who live in the nursery were designed and created in-house by the team at Lola. They have more defined character traits and each has a distinct personality, illustrated with a unique signature performance. 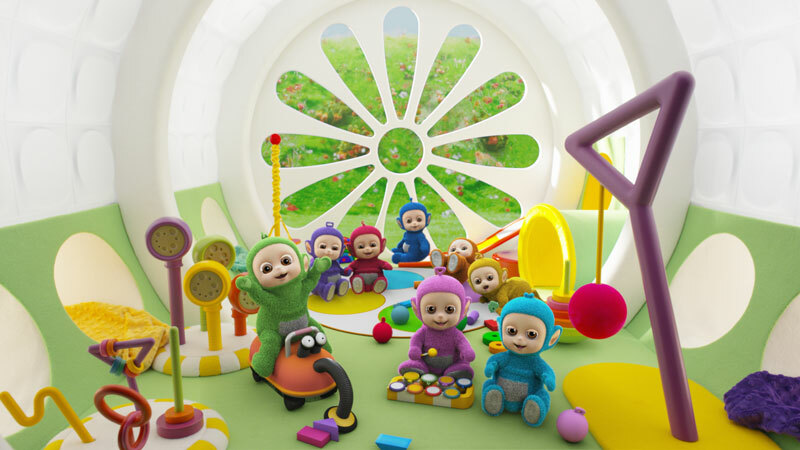 They interact with their live action surroundings to a much greater degree playing with the Teletubbies and their toys both in and out of the nursery. In keeping with the series style, production designer Ant Howells created a real nursery set complete with toys and props, to be used alongside the CG environment. Each sequence was storyboarded and pre-visualised, and the relevant background plate shot. CG toys and props were added only when the Tiddlytubbies were interacting with them. © 2017, Michael Burns. All rights reserved.